When I read Patters devotion for this challenge the song that came to my mind is the old Hymn Trust and Obey which I have shared on my art the first verse which had the word "abide" in it. I asked my husband, Ken what colour would I do this art in and he said "blue" so I looked for a nice kit which had blue in it and chose a recent one I purchased ( actually last month's Scrap Girls Club Kit ). Fonts - Vrinda, Susie's Hand and forgot to take note of the font I used for Abide. That's an interesting piece of art work you have created, Anne-Marie. I like the shades of blue, and the verse you used, too. Very Beautiful page you have created. Love the scripture and the hymn. 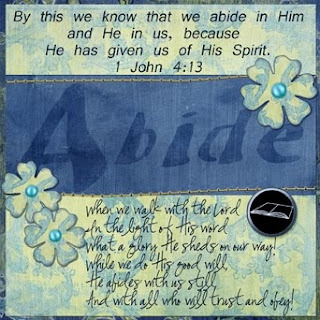 I like the way "Abide" is the focal point of the page. It works. This is such a great page. Love the colors (I have this kit too and love it.) Thanks for stopping by my blog and leaving such a nice comment. I appreciate it.